For some reason, I've had a hankering to reread these books for a few months. A yen I gave in to this weekend when I checked out a Science Fiction Book Club omnibus edition of all 5 novels and a collection of short stories (the latter of which, I haven't read). Having read The Book of Three, I can see where my moral compass may have begun to form. 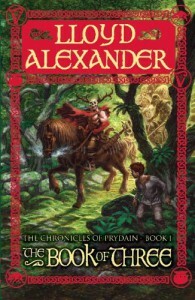 I first read these books in sixth grade as an extracurricular project, and then made a filmstrip of the final book, The High King (yes, a "filmstrip" - for the young'uns out there, think PowerPoint presentation without the laptop :-). The characters are honorable, kind & loyal to their friends, and they fight only when they must. Even looking at it today with a sadly more jaundiced eye, I enjoy reading it, and am happily plowing through The Black Cauldron, book two.